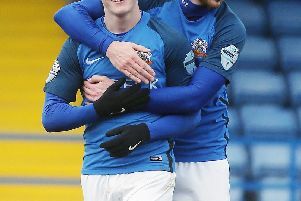 Josh Daniels (centre) and Glenavon team-mates celebrate the game's only goal on Saturday against Dungannon Swifts. Pic by INPHO. The former Derry City winger grabbed the final goal in the previous week’s 2-0 victory over league leaders Linfield before finding the net with what proved both the first and only moment on the scoreboard to see off Dungannon Swifts on Saturday. That left Daniels sitting on three goals in four Danske Bank Premiership displays - in stark contrast to the club’s traditional scorers as Andrew Mitchell has yet to get on the scoresheet in the calendar year and Stephen Murray remains top of the Glenavon scoring charts but out of the starting side. Daniels’ decisive contribution broke the deadlock moments after the Swifts came close to kicking off the scoring, with the winger also alert inside his own penalty area at 0-0 to disrupt Kris Lowe during another dangerous attack by the visitors. 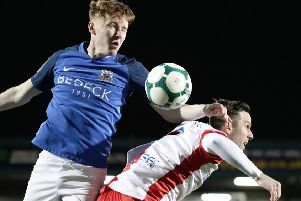 “Josh has been playing well, we always get a shift out of him but one of the biggest aspects was an improvement to his end product,” said Glenavon assistant manager Paul Millar. “Over the last few games you can see that difference and he was also unlucky with another effort from distance. “When on that roll it’s about making the most of it to take full advantage. “I felt we didn’t create much in the first half but did well and in the second we were the better side, although Dungannon looked really dangerous on the break. “It was quite an entertaining, open game, especially after we scored. “Losing Caolan Marron then bringing Daniel Larmour on who then, with practically his first touch, went over on his ankle forced us into defensive changes. “We were poor against Cliftonville but that’s two clean sheets in a row and two home wins going towards the split. “I find the split exciting and we are trying to win every game to see how far it can take us, with so much football to be played. “We want to push it as far as we can go, after being so inconsistent and up and down we now want to put a run together. “We might have four or five players at eight out of 10 every week but four or five also dropping down to a four. Former Glenavon coach Kris Lindsay was back at Mourneview Park as boss in the Dungannon dug-out and he felt frustrated at an inability to maximise key moments - with Johnny Lafferty unable to make the most of two headers plus both Kris Lowe and Daniel Hughes short of the composure required to capitlise on positive play. “They had a couple of chances and good balls whipped in which they didn’t take advantage of, so we went in at half-time happy with the scoreline if not the performance,” said Lindsay. “In the second half I felt it was a completely different story, we were excellent, moving the ball quickly with pace going forward and resolute defensively. “But if you don’t take your chances when on top you don’t win games of football. “Johnny has to hit the target with his first header, Daniel must do better with his effort and Josh made a great tackle on Kris inside the box but did he have to take that extra touch? “I thought we had three great chances then we conceded a poor one with a scrappy deflected effort from Josh. “In any game, no matter which side we are playing, when on top you have to punish the opposition. “But I’ve every faith our attacking players can do it again in the future.